Please refer to the page "Motion in Macrocosm | Classical Mechanics" for notions such as "angular momentum" which facilitate understanding of Quantum Mechanics. In the Bohr model of the hydrogen atom, the electron is in orbit around the nucleus. However, similarly to the photon, which behaves like both a wave and a particle, the electron also has wave-like properties. This means that the electron is somehow "smudged out in space" as mentioned in this Khan Academy video, or that its charge is distributed in space. Classical mechanics can explain the behavior of a particle or a wave but not the combined behavior known as wave-particle duality. This is the objective of Quantum mechanics. In the quantum mechanics version of the atom model, we don't know exactly where the electron is, but we can say with high probability that it is in an orbital. An orbital is the region of space where the electron is most likely to be found. It is also called an electronic shell or shell. To describe the dynamics of a quantum system we apply Hamiltonian mechanics as opposed to Newtonian mechanics. The total energy of the system is represented by an operator termed a Hamiltonian, H, and as mentioned at https://en.wikipedia.org/wiki/Hamiltonian_(quantum_mechanics), by analogy with classical mechanics, the Hamiltonian in quantum mechanics is commonly expressed as the sum of operators corresponding to the kinetic and potential energies of a system. Also, please note the use of the coordinate system: "in Hamiltonian mechanics, a classical physical system is described by a set of canonical coordinates r = (q, p), where each component of the coordinate qi, pi is indexed to the frame of reference of the system". How do we describe the state of the system at time t? In classical mechanics, by solving the equations of motion or Newton's laws you obtain the trajectory of a particle. In quantum mechanics, by solving the Schrondinger equation you obtain the wave function Ψ, which gives the probabilities for an electron to be find on a specific trajectory. We wish to describe the potential and kinetic energy of a quantum system. We will consider the example of the hydrogen atom system. The potential energy is the result of position and configuration and in the case of the electron of the hydrogen atom this is due to the nucleus. The potential energy is given by U= - e^2/ 4πεr. As mentioned at the link http://hyperphysics.phy-astr.gsu.edu/hbase/quantum/hydsch.html#c2 the electron sees/senses a spherically symmetric potential. Therefore, we use spherical polar coordinates to develop the Schrödinger equation. As mentioned at the Wikipedia link https://en.wikipedia.org/wiki/Spherical_coordinate_system, and Figure 1, coordinates (r, θ, φ) as commonly used in physics (ISO convention) represent: radial distance r, polar angle θ (theta), and azimuthal angle φ (phi). For geographic coordinates we know that latitude specifies north-south position and longitude the east-west position. Colatitude is the complementary angle of a given latitude. The polar angle constitutes the colatitude. Azimuth is the angle of the object around the horizon (Figure 2). Figure 1: (From Wikipedia) Spherical coordinates (r, θ, φ) as commonly used in physics (ISO convention). Figure 2: (From Wikipedia - by TWCarlson) Horizontal coordinate system. Note that Azimuth is the angle of the object around the horizon. In order to solve the Schrödinger equation, which is a partial differential equation, we can separate it into individual equations for each variable. m= -ℓ, -ℓ+1, 0, ...ℓ-1, ℓ or 2ℓ+1 values. In conclusion, the three spherical coordinates are associated to the three quantum numbers. 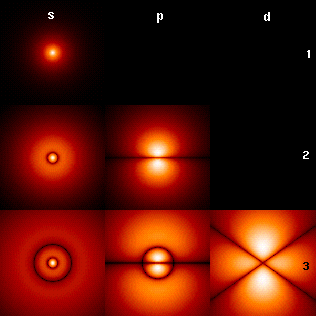 Figure : "Wavefunctions of the electron of a hydrogen atom at different energies. The brightness at each point represents the probability of observing the electron at that point. (By PoorLeno - https://en.wikipedia.org/wiki/Wave_function). Notes: For the sections below, in addition to the Wikipedia and Hyperphysics.phy-astr.gsu.edu links mentioned, the following textbook has been used as reference: Halliday D., Resnick R., Walker J., Priniciples of Physics, International Student Version, 10th Edition, Wiley, 05/2014 (Chapter 40 and Chapter 32, module 32-5). The principal quantum number n represents the relative overall energy of each orbital. The energy level of each orbital increases as its distance from the nucleus increases. (Therefore, indirectly it represents the distance from the nucleus. The sets of orbitals with the same n value are often referred to as electron shells or energy levels." "The minimum energy exchanged during any wave-matter interaction is the product of the wave frequency multiplied by Planck's constant. This causes the wave to display particle-like packets of energy called quanta. The difference between energy levels that have different n determine the emission spectrum of the element." Similarly to an object that perfoms a rotational motion, each electron in an orbital is characterized by an orbital angular momentum L. This is the cross product r*p where r is the distance from the nucleus and p is the particle's linear momentum (v*m). The nucleus is a charged particle and as it moves in a closed loop, its movement is equivalent to a current I flowing in the loop as shown in the figure at the link "magnetic field in the electron frame". It is demonstrated at the figure, that this current I generates a magnetic field B. We are referring to the latter as an effective magnetic field in the (rest) frame of reference of the electron. Due to this, the nucleus exerts a magnetic force on the electron (the electron "sees" or senses this). We can calculate the intensity (strength) of the magnetic field at the distance of the electron (r). As this is due to a circular or orbital motion, an expression including the orbital angular momentum L of the electron is deduced for this magnetic field. The magnetic field will exert a torque that will produce a change in the orbital angular momentum which is perpendicular to that angular momentum. This torque will tend to make the vector angular momentum L parallel to the magnetic field. As a result of the exerted torque, vector L will "tilt" and will be precessing around the direction of the magnetic field (z axis) with a certain angle as shown at this link http://hyperphysics.phy-astr.gsu.edu/hbase/magnetic/larmor.html#c1. This results in Larmor precession. We can calculate the precession angular velocity termed Larmor frequency which is associated with this precession movement. As mentioned above and at the link http://hyperphysics.phy-astr.gsu.edu/hbase/quantum/vecmod.html#c2, the orbital angular momentum for an atomic electron can be represented with a vector model where the angular momentum vector is shown to be precessing about a direction in space. The orbital quantum number determines the magnitude of the orbital angular momentum and describes the shape of the orbital. The shape is denoted by the letters s, p, d and f is defined by values of the magnetic number ℓ, i.e. 0, 1, 2, or 3 respectively. 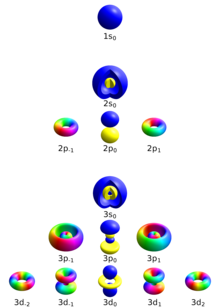 "Their wavefunctions take the form of spherical harmonics, and so are described by Legendre polynomials.The various orbitals relating to different values of ℓ are sometimes called sub-shells, and (mainly for historical reasons) are referred to by letters, as follows:"
As mentioned at this link, there is only one way for a sphere (l=0) fo be oriented in space but orbitals that are polar (l=1) or cloverleaf (l=2) can point to different directions. Therefore a third quantum number is needed to describe the orientation of an orbital in space. In other words although we cannot measure the vector L, we can determine its magnitude and only its projection along a specific axis (usually z). The z-component of the angular momentum is expressed using the magnetic quantum number mentioned above. 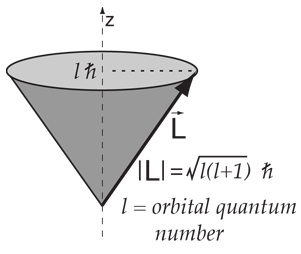 This z-component can take only certain values; in other words it is quantized as mentioned at this link http://hyperphysics.phy-astr.gsu.edu/hbase/quantum/vecmod.html#c2. Specifically, the orbital angular momentum is quantized to values of one unit of angular momentum apart. As mentioned above, its values are dependent on the magnetic quantum number ml. For instance for l=2 it can take the values ml = -2, -1, 0, 1, 2. The magnetic quantum number refers to the projection of the angular momentum in an arbitrarily-chosen direction, conventionally called the z direction or quantization axis. In other words, it is associated to the quantization of the z-component of angular momentum. Also, the magnetic quantum number refers loosely to the direction of the angular momentum vector. As mentioned in Wikipedia, "the magnetic quantum number only affects the electron's energy if it is in a magnetic field because in the absence of one, all spherical harmonics corresponding to the different arbitrary values of m are equivalent." Also the magnetic quantum number (mℓ) was given this name to reflect the fact that it determines the energy shift of an atomic orbital due to an external magnetic field, a phenomenon known as the Zeeman effect. Let us consider an electron orbiting around a nucleus (e.g. a proton for the hydrogen atom). 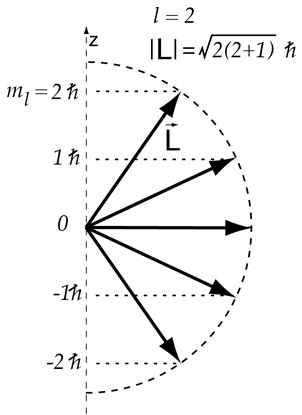 This movement of the electron in a closed loop corresponds to a current I flowing in the loop (please also refer to this link). It is known that a current-carrying wire or loop produces a magnetic field. In order to express the magnetic strength of a magnet or an object that produces a magnetic field like an electric current loop we use the notion of the magnetic moment or more precisely the notion of the magnetic dipole moment in order to infer the equivalence to a magnetic dipole (a magnetic south pole and a magnetic north pole separated by a small distance). The notion of magnetic moment represents the magnitude and the orientation of a magnetic source (e.g. magnet). A charged particle that performs a rotational motion sets up a magnetic field which constitutes a magnetic dipole and the configuration is equivalent to that of a closed loop run by current I. (Halliday D., Resnick R., Chapter 40 p.1107 citing module 32-5 p. 858 and Wikipedia reference). Its direction is given by the right hand rule. Also, as mentioned in Wikipedia, "the elementary magnetic dipole that makes up all magnets is a sufficiently small amperian loop of current I". Following the derivation from this link, we integrate the orbital angular momentum L as mentioned below. where me is the electron rest mass. The orbital magnetic moment (μorb) is quantized. We can find the quantized values by substituting L in the above equation. Similarly to what was mentioned above, we can calculate the value of μorb but not its direction i.e. the vector. However, we can find the direction for a specific axis, usually the z axis. An object rotates around an axis and if this axis passes through the body's center of mass then the object is said to rotate upon itself or spin. Experimental evidence linked to the Stern-Gerlach experiment and the Zeeman effect suggested that the electron posseses except for orbital angular momentum, an intrinsic angular momentum that could be related to a property of "spinning" like a ball in classical mechanics, although this could not be the case. The experiments suggested two different possible states and a value of 1/2. The electron is said to be a spin 1/2 particle. Same applies to protons and neutrons. Similarly to what was mentioned previously, we can find the magnitude of the spin angular momentum but not its direction. However, we can do calculations for one axis, the z axis. "The spin (projection) quantum number (ms) describes the spin (intrinsic angular momentum) of the electron within that orbital, and gives the projection of the spin angular momentum S along the specified axis:"
where ms is the spin magnetic number or spin quantum number, which can have only two values i.e. +1/2 for "spin up" and -1/2 for "spin down". "In general, the values of ms range from −s to s, where s is the spin quantum number, an intrinsic property of particles :"
"An electron has spin number s = ½, consequently ms will be ±½, referring to "spin up" and "spin down" states". In accordance to what was mentioned for the orbital angular momentum, a spin magnetic dipole moment is associated with the spin angular momentum. wher S is the electron spin angular momentum. The spin g-factor is approximately two: gs ≈ 2. The magnetic moment of an electron is approximately twice what it should be in classical mechanics. The factor of two implies that the electron appears to be twice as effective in producing a magnetic moment as the corresponding classical charged body. where ms is the spin quantum number. Note that μ is a negative constant multiplied by the spin, so the magnetic moment is antiparallel to the spin angular momentum. This is represented by the total angular momentum quantum number. The above combination or addition can be represented by a vector model. Before describing this, let us consider some examples from classical mechanics. The above figure (Figure 3) from Wikipedia shows on the left an object that rotates upon itself or "spins" and which has spin angular momentum S. On the right there is an object that performs a rotation around an origin at distance r (it is in orbit around an origin) and has orbital angular momentum L. We can calculate the total angulal momentum J by adding the two vectors L and S following the principle shown at the figure. The above figure (Figure 4) from Wikipedia also shows the principle of the addition of the vectors of the two angular momenta to calculate the total angular momentum. We have described further above the vector model for orbital angular momentum L, where vector L is shown to be precessing around the z axis. Similarly, we can consider that the spin angular momentum vector S is precessing around the same axis. In the following figure which represents an electron with l=1 and s=1/2 or s=-1/2, the vectors of orbital angulal momentum L and spin angular momentum S are added in order to determine the total angular momentum J. Similarly to the case of vector model for the orbital angular momentum (alone), the projection of the total angular momentum on the z axis is quantized to values differeing by one unit of angular momentum. The g-factor gJ is known as the Landé g-factor, which can be related to gL and gS by quantum mechanics (cf. Landé g-factor for details). Quantum numbers describe values of conserved quantities in the dynamics of a quantum system. In the case of electrons, the quantum numbers can be defined as "the sets of numerical values which give acceptable solutions to the Schrödinger wave equation for the hydrogen atom". Four quantum numbers can describe an electron in an atom completely. There is also the total angular momentum quantum number j and the projection of the total angular momentum along a specified axis mj. If an electron is free, it has only its intrinic quantum numbers s and ms. If an electron is "trapped in an atom", it has also the quantum numbers n, ℓ and mℓ. In 1913 "Bohr's atomic model was describing correctly the hydrogen atom. The electron was rotating in circular orbits corresponding to authorized energy levels. By describing the orbits with positive integers, 1, 2, 3 etc. Niels Bohr was introducing the first quantum number of modern physics. As his model was struggling to describe multi-electron atoms, the German physicist Arnold Sommerfeld improved it in 1916 by providing electrons with two additional degrees of freedom: being able to rotate on elliptical orbits like the planets of the solar system as well as modify their trajectory in the presence of a magnetic field. Sommerfeld was thus adding two numbers: "l" the "orbital quantum number" and "m" the "magnetic quantum number". "